A 4-day course designed for military units whose operational requirements utilize the Para-Flite Military HALO/HAHO systems such as the MC-4 & MC-5 and others. This course focuses of the repair and maintenance of these systems at a unit level. 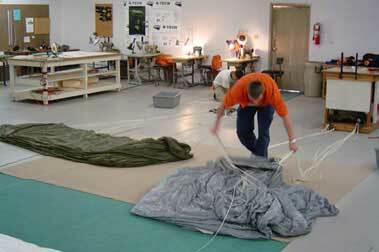 USAPR is the authorized training facility for Repair and Maintenance of Para-Flite MC4 & MC5 parachute systems. Minimum of 2 candidates required to run the course. Candidates are required to provide one complete set of equipment which includes main and reserve parachutes and harness & container. Equipment that is in need of service is desirable.